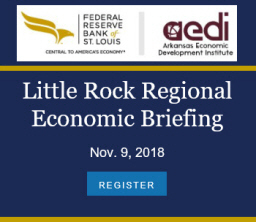 New details of Governor Hutchinson’s promised tax cut proposal came out last week in the form of proposed legislation (Senate Bill 6), as well as an explanatory note from the Governor’s office: Governor’s Tax Plan (original link here). Some of the details are complicated, and even a bit quirky. In this analysis, we consider how three considerations appear to have interacted to come up with the specifics of the plan. First, the plan partly builds-upon and partly replaces the tax code established by Act 1459 of 2013 — which was scheduled to phase in fully only in the current tax year, 2015. Second, the plan has been promoted as a tax cut for the “middle class,” so its impact is tightly targeted to taxpayers within a given range of incomes. And third, as always, the state revenue impact was likely considered and factored into the phase-in aspects of the proposal. We’ll leave it to the budget experts to explain the impact on state revenue, and take no position on the issue of whether this tax cut is “affordable.” However, it does seem that some features of the proposal are overly complex, and some of the quirkier aspects of the plan have potentially unintended consequences. Simpler modifications to the tax code might be proposed that would have very similar implications for revenue and tax-burdens, without the potential for economic inefficiencies that are present in the proposed plan. Table 1, below, summarizes the statutory marginal tax rates for the Governor’s tax-cut plan, which includes 2015 as a phase-in year and the full impact of the tax cuts taking effect in tax-year 2016. 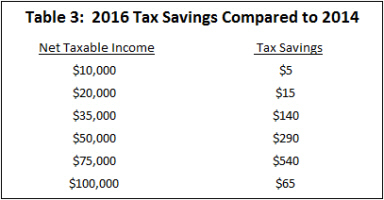 The table also includes the tax rates from Act 1459 that went into effect as of January 1, 2015. The Governor’s plan retains the tax cuts from Act 1459 for taxpayers with taxable incomes below $21,000 for 2015 and thereafter. For taxpayers with incomes ranging from $21,000 to $75,000, however, the marginal rate cuts of 0.1% per tax-bracket from Act 1459 are removed, and replaced with reductions of one full percentage point in the top two tax brackets — but not until 2016. Taxpayers with incomes above $75,000 face yet another tax schedule, which cuts the very top tax rate by 0.1% (after a one year delay) but eliminates the Act 1459 tax-rate reductions on all income under $35,100. Sources: Governor’s Tax Plan; Act 1457 of 2013. But the fact that there are three separate marginal tax rate schedules for different categories of total taxable income is an unusual feature. Typically, a progressive tax structure is implemented by having higher marginal tax rates apply to successively higher brackets of income. However, it is unusual to have the tax rate on lower earnings brackets change after crossing an income threshold. In cases where it does, as in this plan, there are discontinuities in average tax rates and total tax burdens that create spikes in effective marginal tax rates. For example, after full implementation in 2016 the proposed tax plan would raise tax rates on incomes over $75,000 — not just on any income above $75,000, but on all earnings up to that point as well. This would create strong incentives to avoid working harder and earning income above the $75,000 line. In fact, without some adjustment, many taxpayers with incomes just above $75,000 would find themselves experiencing a significant reduction in after-tax income after receiving an increase in pay — that is, the effective marginal tax rate of greater than 100%. Economists call this a tax-rate “cliff.” It creates the potential for tax policies to influence taxpayer behavior, and thereby result in potential economic inefficiencies. When we put it all together, the Governor’s tax-cut proposal can be illustrated graphically as in Figure 1, which traces out total taxes owed as a function of taxable income. Figure 1 compares the fully-implemented Governor’s Tax Plan to 2014 tax burdens, as well as 2015 taxes under current law. The main impact of the tax plan is clear: A significant reduction in taxes for taxpayers with taxable incomes between $21,000 and $75,000. 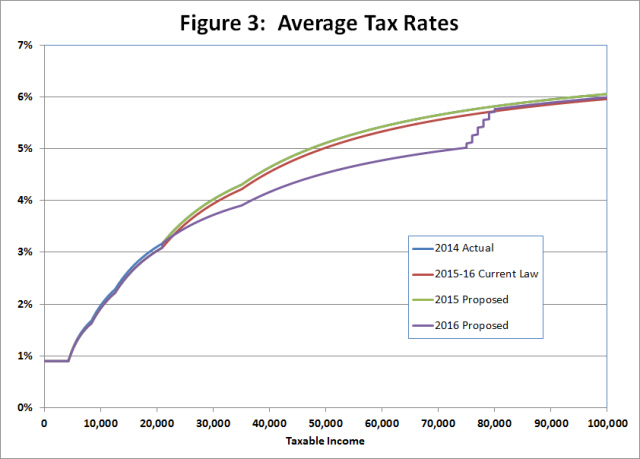 But if we compare the proposed phase-in for 2015 with 2014 actual tax rates (the purple line in Figure 2) we see that the tax savings for taxpayers with incomes under $21,000 are retained but there are no net tax savings for taxable incomes greater than $21,000. This is due to the fact that marginal tax rate reductions that were scheduled to go into effect in 2015 under Act 1457 are repealed or postponed under the Governor’s plan, leaving the 2014 tax schedule in place for 2015 for all incomes above $21,000. When it comes to gauging the revenue effects on state government finances–and for that matter, how changes in tax policy affect taxpayer decisions–the relevant comparison is how the proposed plan compares to current law. 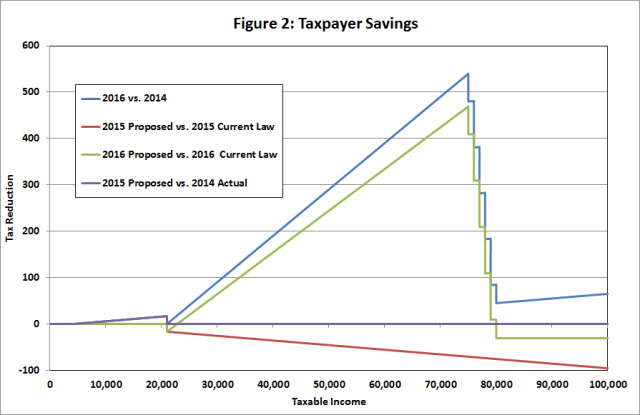 Figure 2 shows that the overall tax savings to taxpayers are negative in 2015 by this comparison (the red line). By eliminating and/or postponing the marginal tax rate increases for 2015 that were built into Act 1457, the Governor’s Plan could be characterized as a tax increase for all taxpayers with incomes over $21,000. Accordingly, the revenue effects of the Governor’s Plan are positive for tax year 2015 compared to the current-law baseline. When the plan is fully implemented in 2016, the taxpayer savings relative to current law are a mix of tax cuts and tax increases (the green line). For most taxpayers with incomes between $21,000 and $80,000, the plan represents an unambiguous tax cut. However, taxpayers with incomes greater than $80,000 will face a tax bill that is approximately $30 higher than under current law. In addition, there is another set of taxpayers with incomes ranging from $21,000 to about $22,500 who would pay higher taxes under the Governor’s Plan than under current law. The comparison of proposed tax rates to current-law tax rates is relevant for evaluating the fiscal impact of the plan, where timing is everything. Fiscal impact is gauged by fiscal year while tax-regime changes align with the calendar year. By waiting until tax-year 2016 to fully implement the changes, the impact on state revenues in FY2016 (July 2015-June2016) represents the net effect of higher revenues in 2015 and lower revenues in the first half of 2016 (relative to current law). This softens the blow to state revenues relative to the case where the tax cuts are made immediate in 2015. The full effects of the plan are not fully reflected in the state budget until FY2017. However, by deferring the bulk of the tax cuts to 2016, the Governor’s Plan does more than just reduce the short-run impact on state finances. It also puts in place an incentive for influencing economic decisions over time. When taxpayers know that their tax burdens will decrease next year, there are incentives to rearrange contracts and payments to take advantage of lower future tax burdens. Whenever people are making decisions based on the timing of tax law changes instead of the true underlying costs and benefits, economic efficiency is potentially sacrificed. Another important potential source of economic inefficiency in the Governor’s Plan is the introduction of tax rate “cliffs” into the tax structure. As previously described, a tax rate “cliff” exists when an increase in earned income results in a negligible increase or even a negative change in disposable after-tax income. 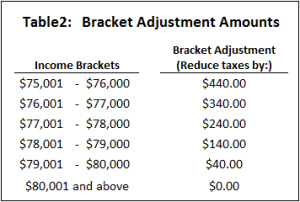 In the absence of the bracket adjustments shown in table 2, for instance, an increase in income from $75,000 to $75,001 would engender a tax increase of $500.17, implying a marginal tax rate of 50,017%. Clearly, earning that one extra dollar of income should be avoided, if possible. The introduction of the bracket adjustments makes the effect of the cliff smaller, but in the process creates six cliffs where only one existed before. These breakpoints are summarized in Table 4. 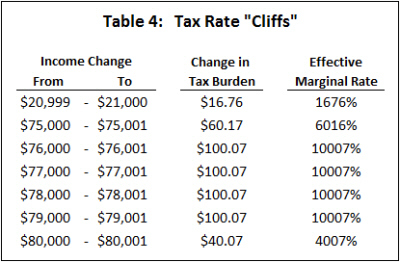 By breaking the income range into 5 categories with a discrete tax change at each break point, the magnitude of the tax rate cliffs are smaller than if there was just one big cliff. Moreover, the discrete nature of the tax tables used to actually calculate taxpayer obligations will smooth out some of the differences. Nevertheless, these localized tax rate cliffs exist in the proposed tax structure, introducing the possibility of effecting taxpayer behavior. Again, any time that economic decision-making is influenced by tax policies instead of underlying costs and benefits, economic efficiency is potentially sacrificed. In addition to the discrete jumps in tax burdens associated with the bracket adjustments for incomes in the $75,000 to $80,000 range, there is an additional tax cliff at the $21,000 income level. This particular break point is associated with the fact that marginal tax rates on the first $20,999 increase once a taxpayer hits the $21,000 threshold. Although occurring at a lower income level with a smaller marginal tax-rate spike, the economics of this tax cliff is the same as those in the higher tax brackets — the potential to influence taxpayer behavior and create economic inefficiencies. Even if taxpayer behavior is not explicitly affected, some might argue that there is a fundamental unfairness in a tax code where some taxpayers inadvertently find themselves in a situation of having lower after-tax income when their pre-tax income goes up. Figure 3, which presents average tax rates, summarizes some of the features of Governor Hutchinson’s tax proposal. When fully-implemented, average tax rates are reduced for taxpayers with incomes of less than $80,000. The tax cuts are the largest for taxpayers with incomes in the “middle.” During the transition year of 2015, average tax rates increase for all taxpayers making more than $21,000. Even after full implementation, taxes paid by those with incomes over $80,000 will be higher under the proposal than under current law. 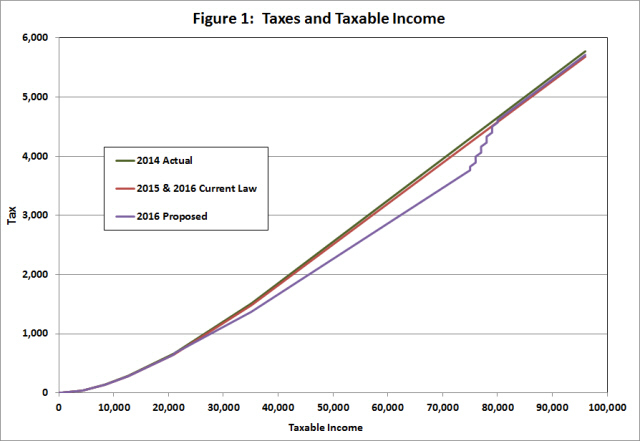 The “tax cliffs” discussed above show up in Figure 3 as discrete jumps in average tax rates. The features phase-in features and undesirable tax cliff features of the Governor’s proposal could be mitigated by eliminating the multiple tax schedule structure described in Table 1, and by implementing the new plan immediately instead of having a phase-in year. However, such a modified plan would generate its own practical and political problems. For example, the phase out of tax cuts for individuals with incomes over $75,000 could be accomplished by having those taxpayers pay the same rates as lower-income taxpayers, but facing a new income tax surcharge on incomes over $75,000. Such a proposal would eliminate the tax-cliffs, but would be unpopular among many politicians and voters. Ultimately, the adoption of tax structures depends on both economic and political considerations. While recognizing political aspects of the issue, however, economists tend to focus more directly on issues of efficiency: A tax code should be structured to raise the revenue necessary to finance government activities in the most efficient way possible. It is in that spirit that we offer this analysis, recognizing the limitations of what is politically possible but pointing out what would nevertheless be economically desirable.